143 other birds have this item in their bag or wishlist! 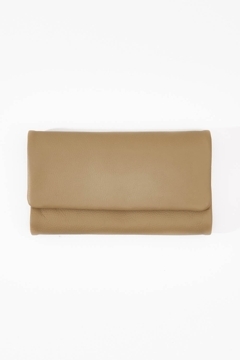 Oh so soft and super practical the Paiget Wallet from Stitch & Hide is a real winner in our books. Designed as a three fold wallet, this divine wallet is full of surprises. I received my wallet soon after I placed my order..Birdsnest is so efficient. I opened my parcel to find the wallet is quite small. (The photo makes it appear larger). However it made me realise that my old, well worn wallet was packed with unnecessary 'stuff'. This wallet feels lovely to hold and it is just right for my cards and Driver License. I love it now! Love the colour and feel of the wallet and there is plenty of room for cards, coin and notes. Some card compartments are too small for cards. Also when coin section is opened the card section flops backwards revealing your cards for all to see, so you have to be careful how you open it. The zipper pull tab is too heavy for the zip although this can be remedied by attaching a lighter zip tab. Lovely soft leather, with lots of card spaces as well as somewhere to put coins (a rarity). Beautiful color too. Very pleased with my purchase.